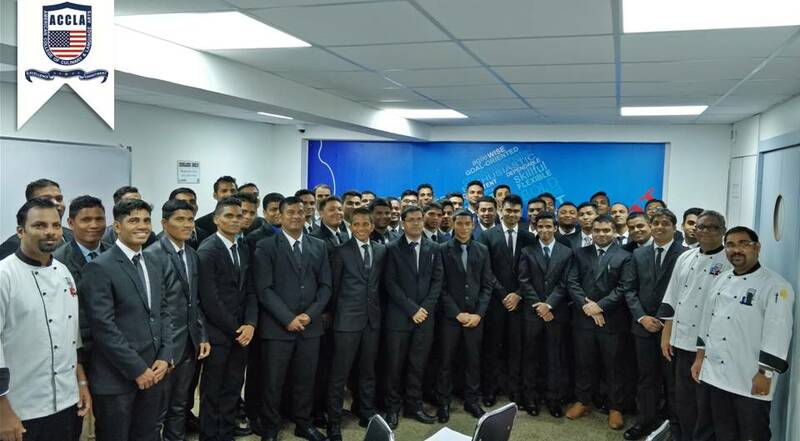 This entry was posted in Media Releases, Success Stories on June 14, 2018 by admin. Cooking with Masterchefs at ACCLA! Cooking as an art has constantly evolved while staying true to its purpose of playing with flavors and delighting our palates. While the passion for Cooking is aplenty, we realised that tiny errors in techniques and combinations is what is stopping everyone from cooking perfectly. 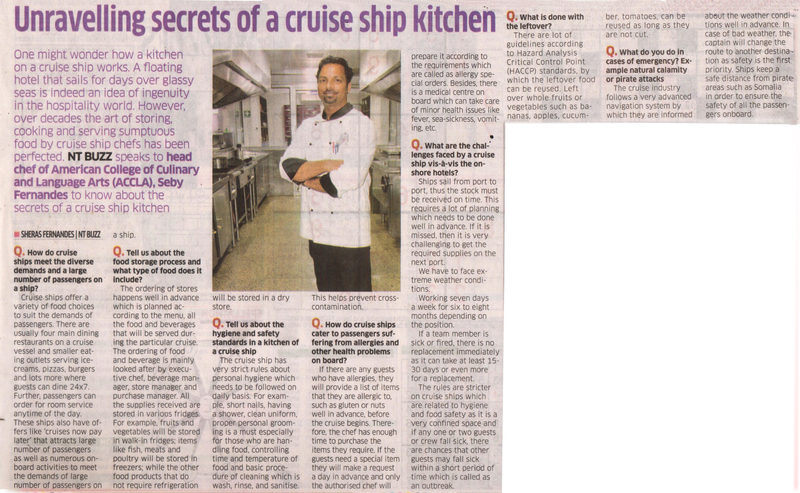 On the 7th, 14th and 21st of May we held “Cooking with Masterchef” classes at our Academy to resolve this issue. 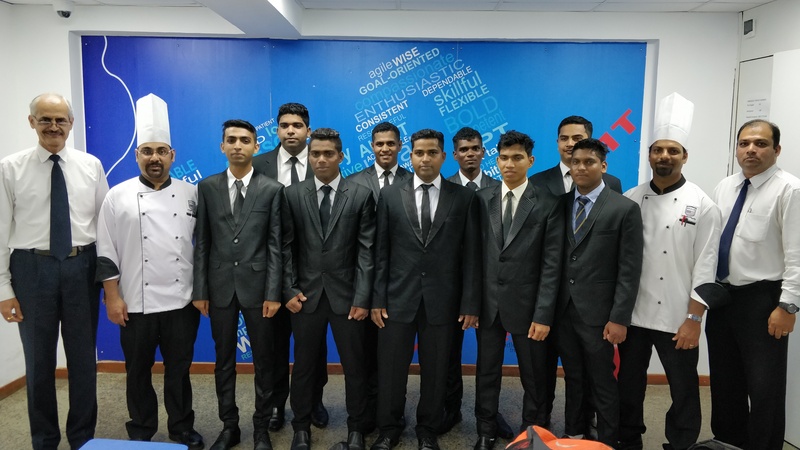 We collaborated with our experienced Masterchefs to create this event which was open to any cooking enthusiasts from homemakers to restaurateurs to students and alike. While the seats were limited for each day, we held them separately for 3 consecutive Saturdays for convenience’s sake. 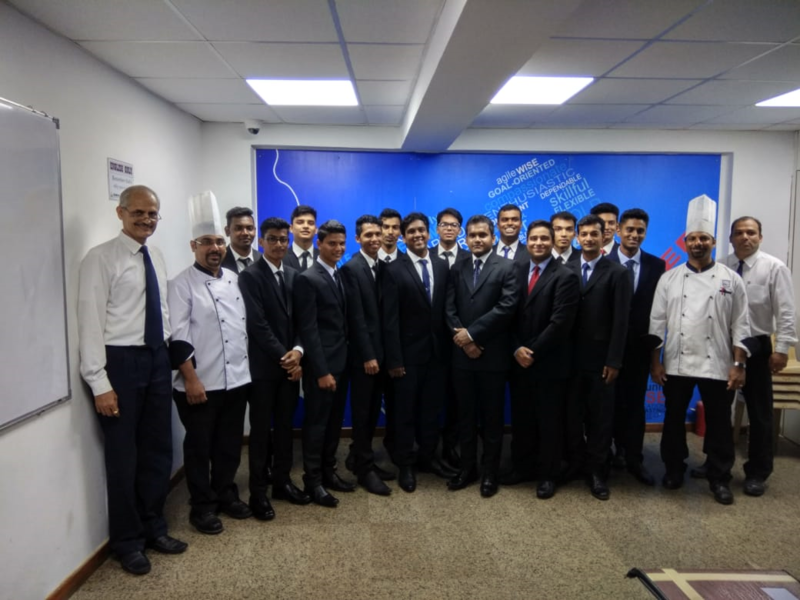 We prepped for the class by putting together a meticulously crafted 4 course meal which would be taught for the sessions. The menu items were carefully chosen based on the variety of cooking techniques that each would address and the mix of flavors that they comprised of. 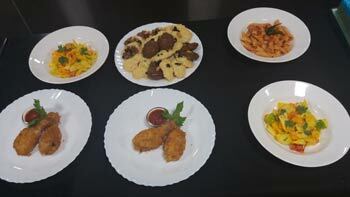 Each class had a different menu and a different Chef teaching it in order to address various techniques and expertise. Each menu began with salads including American Potato Salad, Avocado Salad and Mango Salad. The soups were Cream of Porcini Mushroom Soup and Shrimp Bisque. Spaghetti Meatballs, Chicken Parmigiana and Country Style Fried Chicken with Salsa Picante were some of the main courses included while for dessert there was Blueberry Panna Cotta, Crepe Suzette and Dates Pancake. While many of these dishes were Continental, we ensured that we prepared them using locally available ingredients so our participants could replicate them repeatedly with ease. 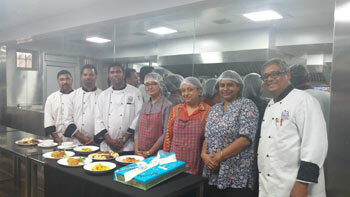 The sessions were scheduled for the duration of 3 hours during which cooking techniques were demonstrated to the participants. Live equipments and ingredients were used along with professional cooking tools to appropriately depict the cooking methods. Participants were given hands on experience in preparing the dishes for maximum effectiveness while questions and conversations were encouraged. Appropriate hygiene measures were yielded to encourage healthy cooking. 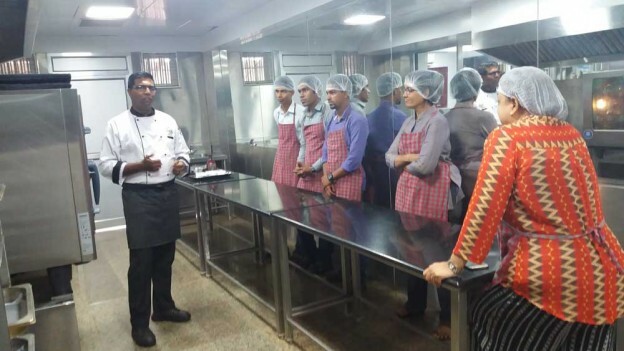 The presence of multiple Chefs in each session ensured that everyone got the assistance or clarification that they needed. 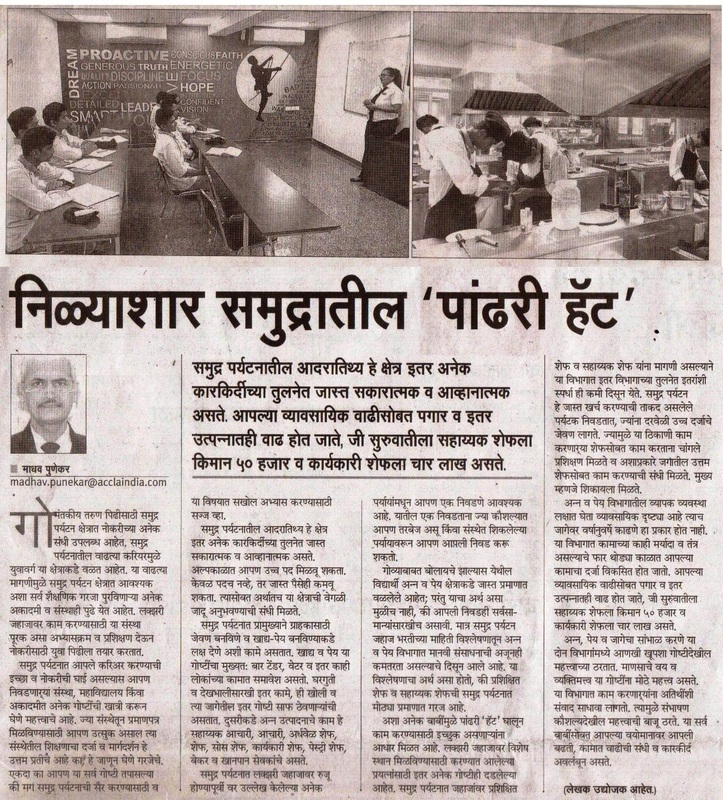 The 3 days saw a number of participants along with enough enthusiasm to get these sessions going. We were successful in spreading our knowledge to a great many people from various backgrounds all armed with a passion for cooking. All in one, these sessions were a grand success! This entry was posted in Media Releases on May 19, 2016 by admin. 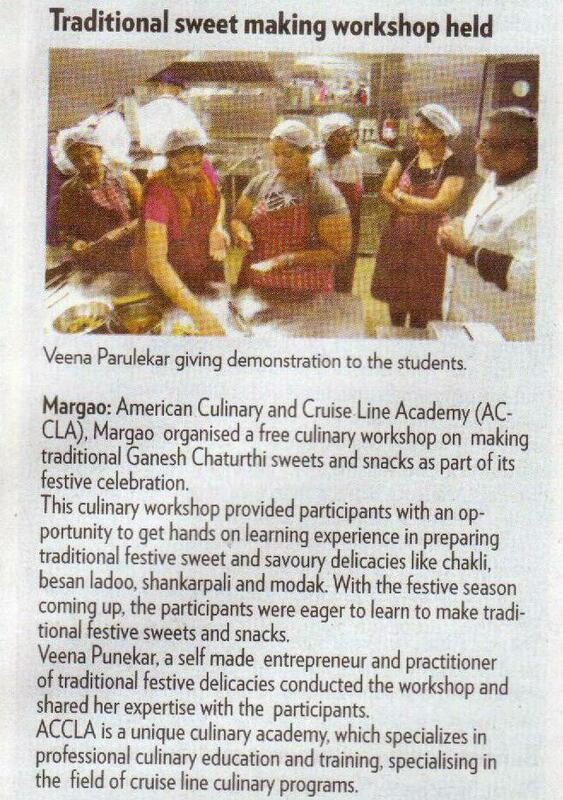 ACCLA organized culinary workshop on making traditional Ganesh Chaturthi sweets and snacks. 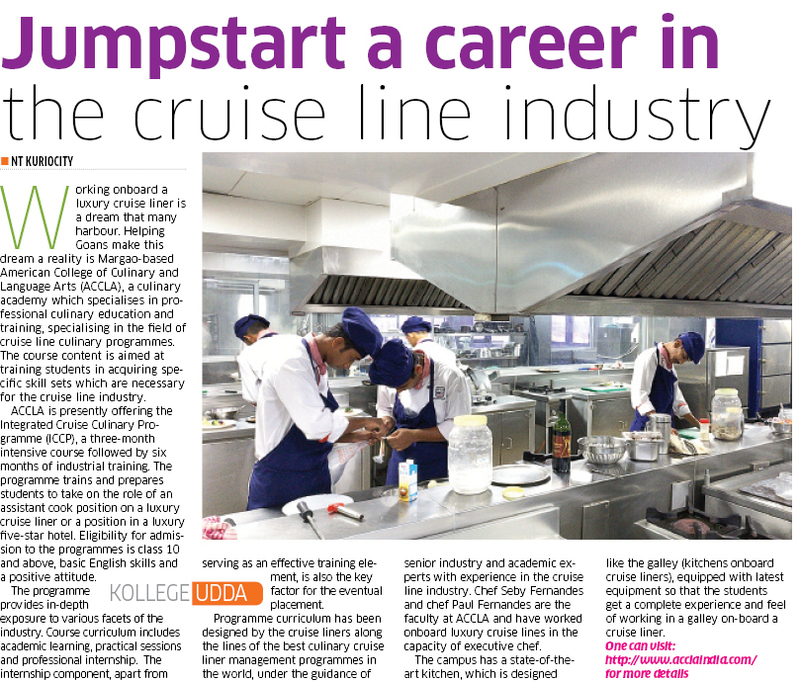 American Culinary and Cruise Academy, Margao organized a free culinary workshop on making traditional festive sweet and savory delicacies like chakli, besan ladoo, modak etc. This entry was posted in Media Releases on September 24, 2015 by admin.